Lidia Bastianich is back! 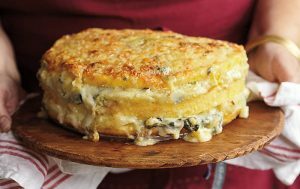 She shares recipes from her new book, Lidia’s Celebrate Like an Italian. And we’re ringing in the holidays with local music and local beer. Steve Cusano, founder and owner of Parkville Sounds (a creative space for musicians), and Joy Braddock, co-owner of Hog River Brewing—both in Hartford—join us in the studio to talk about Twang Thursdays: the ultimate coming together of music makers and craft-beer lovers. Their businesses are community anchors, bringing art and vitality to the Parkville section of Hartford. Plus, Alex Province introduces the gang to a special-occasion Syrah from France that you’ll be tempted to drink fireside. It’s velvety and bold and perfect with a holiday roast or an intimate dinner for two. Faith calls it “red liquid gold,” and every sip is to be savored. 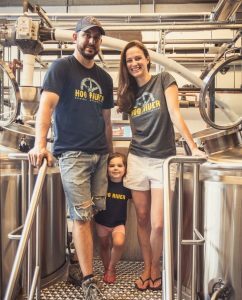 • Joy Braddock — co-owner of Hog River Brewing Co. NOTE: The teams at Parkville Sounds and Hog River Brewing Co. co-present Twang Thursdays each week from 7-9 pm in Hog River Brewing’s taproom. Visit Hog River Brewing’s website for information about the brewery and additional events. And visit the Parkville Sounds website for information about lessons, rehearsal space, or studio sessions. You have to know about Scratch Baking in Milford. They have been awarded the best bakery in CT by Trip Advisor 3 years running. I’ve had the opportunity and good fortune to travel all over the world and this is one of the best bakeries ever. Always, amazing and organic when possible. The owner Lesli Flick cut her teeth with Martha Stewart’s and John Barricelli (SoNo Baking Co), their breads are amazing, best croissants this side of Paris and speciality desserts that will blow your mind. Go, Go Go, they have changed the week end culture in Milford.